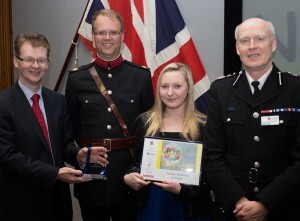 Natalie Markham from Blackpool, who helped to raise thousands of pounds for charity, has won the High Sheriff’s Young Citizen of the Year Award in recognition of her outstanding achievements. The 14-year-old Bispham High School pupil won the award after judges heard how, following a difficult childhood, she had turned her life around and was now role model for other young people. Over the past three years, Natalie has taken part in concerts, cake sales and dance-a-thons, collecting over £7000 for Red Nose Days, Comic Relief and Children in Need. Natalie lives with her mum and over the last two years, her family has been hit by serious illness – her disabled grandmother was diagnosed with cancer and her grandfather fell and broke his shoulder blade. Whilst they received treatment, Natalie helped tirelessly by cooking meals, cleaning, washing and shopping. Her bright nature cheered them up and helped them on their road to recovery. Each year she volunteers at summer school which helps new pupils to make friends and settle in to high school more quickly. Natalie received a trophy and £250, with £250 going to her chosen charity, while Lauren and Beth received £100 each and Team 53 received £150 with a trophy. BAE Systems were once again title sponsor for this year’s Awards, and are proud to be associated with the scheme.